The residents barricaded the R55 with burning tyres and stones. About 350 angry residents from Mooiplaas informal settlement on Thursday took to the streets, blocking roads and demanding RDP houses that they were promised years ago. The residents barricaded the R55, near the M10 Wierda Park road, with burning tyres and stones. Mooiplaas resident Hazel Kgane (not her real name) said she was not happy about the way in which the protesters conducted themselves because they abused anyone who did not want to be part of the protest. “They must tell everyone that by a certain date no one goes to work so that we can have a chance to call our bosses and report on time,” she said. Kgane claimed she was attacked and prevented from going to work on Thursday by the angry residents. “They attacked us and I ran away and hid in the bushes to save my life. The protesters forced foreign nationals to take part in the marches even though they do not qualify for an RDP house. Everyone knows that Zimbabweans, Malawians and people from Lesotho cannot be granted an RDP; why are they preventing them from going to work?” she said. Some residents said the situation with RDP houses would only get better if those who qualified for a house were to form their own group and march. “Those who qualify for RDPs have the right to fight for their needs, but not to force everyone – even those who do not qualify for houses [to participate],” another resident said. They accused the protesters of hurting people and robbing them. Kgane accused the protesters of committing crime and said they rob, hurt and abuse people during these violent demonstrations. 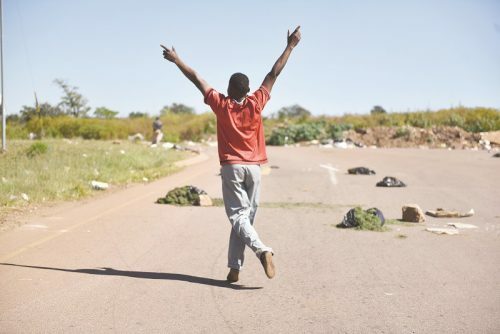 Erasmia police spokesperson Constable Tumisang Moloto said they had not received reports of any incidents of violence, injuries or damage to property and no arrests had been made. He said residents dispersed peacefully.